U.S. Trillion Dollar Battle: Print, Baby, Print! •Consumers buy goods or services because they believe they are “good value;” in other words, they only exchange money for goods in a deal where they see themselves benefiting. Consumers should not blame companies for “over-priced” goods or services; they should blame themselves for paying such prices. •The perception of what is good value varies from person to person. What may be a must-have $80 a month cable TV subscription, may be a waste to others. It also varies over time, as some may deem a vacation well worth the money during good times, but rather stay at homes when times are tough. •When monopolies or governments impose prices, distortions, such as supply disruptions can occur. Or conversely, when the government keeps the price of fuel artificially low, it can significantly erode the government’s ability to provide other services, possibly even bankrupt it. •Highlight the not so well known fact that the Federal Reserve (Fed) does not mark its holdings to market. The lack of mark-to-market accounting leading up to the financial crisis is a key reason why the financial system was brought to its knees in 2008. A major loss at the Federal Reserve, such as writing down a $1 trillion coin to $1,600 may not be too worrisome for those that know that even a negative net worth won’t render a central bank inoperative. However, losses at the Fed would deprive the Treasury of what has become an annual transfer of almost $90 billion in “profits” (see MerkInsight Hidden Treasury Risks?). •Dilute the value of the dollar. 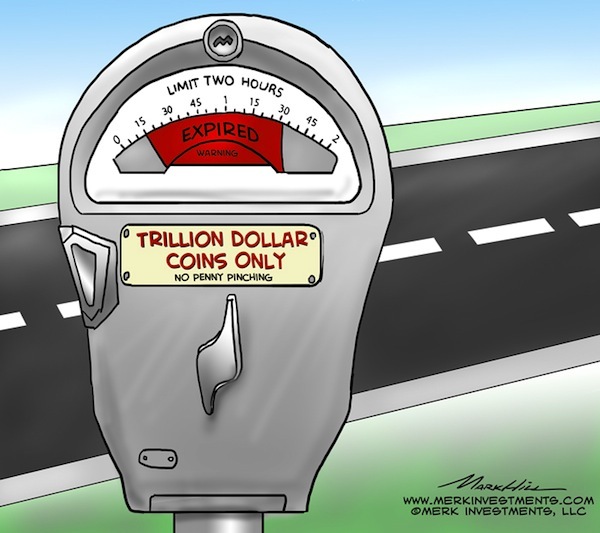 If the Treasury whips up an additional trillion to spend through trickery, odds are that a trillion would no longer be worth what it used to be. But wait, $1 trillion is already not worth what it used to be, and a $1 trillion coin has not even been minted. And I’m not talking about our grandparents: who had ever heard of trillion dollar deficits before the financial crisis? The Federal Reserve holds just under $3 trillion in assets, up by over $2 trillion since early 2008. When the Federal Reserve engages in “quantitative easing”, QE, QE1, QE2, QE3, QEn or however one wants to call it, the Fed buys securities (mortgage-backed securities, government bonds) from large banks, then credits such banks’ accounts at the Fed. Such credit is done through the use of a keyboard, creating money literally out of thin air. Even Fed Chair Bernanke refers to this process as printing money, even if banks have not deployed most of the money they have received to extend loans. However, the more money the Fed prints, the more debt securities it buys, the greater its income; it’s that argument that has allowed Bernanke to claim that his operations have been “profitable,” neglecting to state that such money printing may pose significant risks to the purchasing power of the dollar. •If the Treasury wants to issue debt, it can do so without the Fed. •If the Treasury wants to manage the maturity of the outstanding government debt portfolio, it can do so without the Fed’s Operation Twist. •$100 bills are all one and the same. Well, almost. In some developing countries, newer bills are worth more than older ones (because of counterfeit bills in circulation). •A platinum coin has intrinsic value: its fine ounce content of platinum. In contrast, the $100 bill is worth the paper it is printed on. •The holder of a $100 bill may deposit such bill into his or her account. •The bank can deposit the $100 bill at the Fed. In turn, the Fed will credit the bank with $100 in checking account. •The bank can withdraw the deposit of $100 from the Fed. •The bank account holder can withdraw $100 from the bank yet again. Please sign up for our Webinar on Tuesday, January 15, 2013, that focuses on our outlook for this year. Please also sign up for our newsletter to be informed as we discuss global dynamics and their impact on gold and currencies.